Home :: Turks and Caicos Islands :: Turks & Caicos Islands 1912-1936 :: Turks and Caicos 1918 1d Rose-carmine - War Tax. SG146. 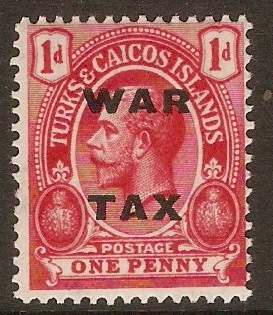 Turks and Caicos 1918 1d Rose-carmine - War Tax. SG146. Unmounted mint 1918 1d Rose-carmine - War Tax. SG146. Simply enter your details below and we will send you an e-mail when “Turks and Caicos 1918 1d Rose-carmine - War Tax. SG146.” is back in stock!